However, investor expectations of U.S. economic growth will be disappointing in the first half of 2017 predicts economist Paul Kasriel based on his analysis of the slowdown in the growth of commercial bank credit and the monetary base in December 2016. As a result of some Fed actions taken in 1936 and 1937, the U.S. economy, after experiencing a robust economic recovery starting in early 1934, slipped back into a recession midyear 1937, which lasted through midyear 1938. 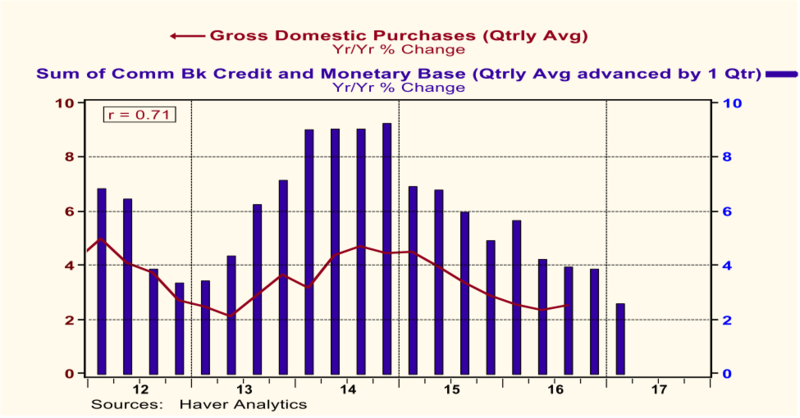 Based on the recent slowdown in thin-air credit growth, I believe that a significant slowdown in the growth of nominal and real U.S. domestic demand will commence in the first quarter of 2017. The duration and magnitude of this slowdown depends on the future behavior of thin-air credit. Let’s briefly review the U.S. monetary history of 1936-1938. In response to the robust recovery the U.S. economy was experiencing and the high level of excess reserves the banking system was maintaining, the Fed, in a series of steps between August 1936 and May 1937, doubled the percentage of cash reserves banks were required to hold against their deposits. The Fed believed that these de jure excess reserves held by banks were de facto excess reserves. That is, the Fed did not believe that banks desired to hold the amount of de jure excess reserves that were in existence. If these reserves held by banks truly were in excess of what they wanted to hold, then it was surmised by the Fed that banks would engage in the creation of new credit for the economy by some multiple of the existing excess reserves. If this creation of new bank credit were to occur against a backdrop of an already robust economic expansion, the U.S. economy would be in danger of overheating. As a result of this reasoning, the Fed chose to “sterilize” some of these excess reserves by converting them into required reserves. As it turned out, with the experience of bank runs of the early 1930s still fresh in the memory of bank managers, a large proportion of the existing excess reserves were, in fact, desired to be held by banks. As a result, when the Fed decreed that a large portion of these excess reserves would become required reserves, banks attempted to restore their holdings of excess reserves. In this attempt, banks contracted their loans and investments – bank credit. Because only the Fed can increase or decrease total reserves, this banking system contraction in bank credit did not, in and of itself, increase total reserves. But what it did do was contract bank deposits, which in turn, reduced required reserves. For a given amount of total reserves, a reduction in required reserves implies an increase in excess reserves. Following the contraction in bank credit and the sharp slowdown in the growth of bank reserves, the U.S. economy entered a recession at midyear 1937. In sum, the Fed’s decision back then to double the reserve requirement ratio against bank deposits set in motion a sharp deceleration in the growth of thin-air credit that resulted in a U.S. recession. Let’s fast forward about 80 years. The Fed has not raised required reserve ratios. But, as shown in Chart 1, the Fed has begun contracting an element of thin-air credit, the monetary base (cash reserves held by depository institutions plus currency in circulation). In 2014, the Fed began tapering its purchases of securities in the open market, which slowed the growth in the monetary base. In 2015, the Fed ceased altogether its securities purchase program and contracted the monetary base at the end of 2015 in order to push up the federal funds rate by 25 basis points. For reasons still a mystery to me, the Fed stepped up its contraction in the monetary base in the second half of 2016, culminating in a further contraction in December 2016 in order to push up the federal funds rate another 25 basis points. 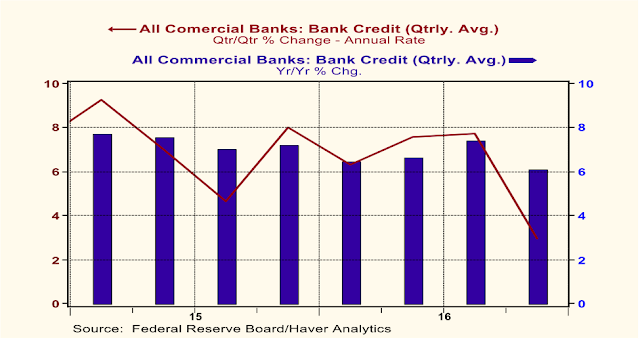 Another major element of thin-air credit, credit created by commercial banks, after cruising along at robust growth rates in 2015 and most of 2016, suddenly decelerated sharply in Q4:2016. I am not aware of any new regulations or credit-quality concerns that would have motivated commercial banks to slow their acquisitions of loans and securities. Yes, short-maturity bank funding rates have crept up in the past two years in response to actual and expected increases in the federal funds rate. For example, in the week ended September 30, 2016, the average three-month LIBOR interest rate was 21 basis points higher than it was in the week ended July 1, 2016. If a 21 basis point increase in bank funding costs caused the quantity demanded of bank credit to slow as much as it did in November and December 2016, then the interest elasticity of bank credit demand is extraordinarily high. And if, in fact, the interest sensitivity of bank credit demand is so high, the Fed might want to take this into consideration in its federal funds rate targets going forward. Okay, it is a mystery to me as to why the Fed contracted the monetary base as much as it did in 2016 and why bank credit growth fell off a cliff in Q4:2016, but as I amusingly remember hearing in so many corporate staff meetings – it is what it is. So, let’s combine bank credit with the monetary base to see what the behavior of this thin-air credit aggregate has been of late. This is presented in Chart 3. 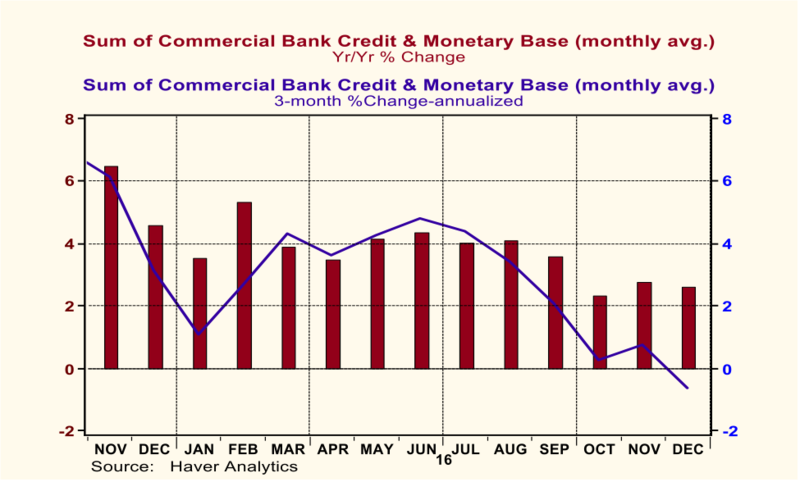 On a year-over-year basis, growth in the sum of commercial bank credit and the monetary base in December 2016 was 2.6%. To put this into historical context, from January 1960 through December 2016, the median year-over-year growth in monthly observations of the sum of commercial bank credit and the monetary base was 7.1%. In the three months ended December 2016, the annualized percentage change in this measure of thin-air credit was minus 0.6%. So, there has been a deceleration in the growth of this measure of thin-air credit to a rate that is quite low compared to its longer-run median rate. So what? Chart 4 provides an answer to this question. Plotted in Chart 4 are year-over-year percent changes in quarterly observations of nominal Gross Domestic Purchases and of the sum of commercial bank credit and the monetary base. The year-over-year percent changes in the sum of commercial bank credit and the monetary base are advanced by one quarter in order to be consistent with my hypothesis that the behavior of thin-air credit leads or “causes” the behavior of nominal Gross Domestic Purchases. Gross Domestic Purchases are defined as Gross Domestic Product minus exports plus imports. The correlation coefficient between these two series from Q1:2012 through Q3:2016 is 0.71. If these two series were perfectly correlated, the correlation coefficient would be 1.00. So, although not a perfect relationship, there does appear to be a relatively close positive relationship between changes in this measure of thin-air credit and changes in nominal domestic purchases of goods and services. With the year-over-year growth in this measure of thin-air credit slowing from 3.9% in Q3:2016 to 2.6% in Q4:2016 (indicated by the Q1:2017 blue bar in Chart 4 because growth in thin-air credit is advanced by one quarter), this augurs poorly for growth in nominal Gross Domestic Purchases in Q1:2017. If growth in U.S. domestic demand falters in Q1:2017, as “predicted” by the recent behavior of thin-air credit, then the Fed is unlikely to push the federal funds rate higher until it sees a recovery in demand growth. Even if the Fed holds off on raising the federal funds rate, it still is unlikely to step up growth in the monetary base component of thin-air credit in Q1:2017. As mentioned above, I am at a loss to explain the recent sharp deceleration in bank credit growth. But unless growth in this component of thin-air credit does re-accelerate, then very weak growth in total thin-air credit would likely persist through Q1:2017, which would have continued negative implications for growth in domestic demand for goods and services into Q2:2017. The Fed’s actions of 1936-37 caused a sharp slowdown in the growth of thin-air credit, which resulted in the recession of 1937-38. It is too early for me to forecast a recession in 2017 because of the Fed’s disregard for the recent growth slowdown in thin-air credit. But I do believe investor expectations of U.S. economic growth will be disappointed in the first half of 2017. All else the same, this economic-growth disappointment has positive implications for U.S. investment grade bonds and negative implications for risk assets such as U.S. equities. One factor that could stimulate thin-air credit growth would be a sharp increase in federal credit demand resulting from tax cuts and/or discretionary spending increases. This increased credit demand would put upward pressure on the structure of U.S interest rates. If the Fed were unwilling to allow the federal funds rate from rising under these circumstances, then both the monetary base and bank credit would rise in the face of the increased credit demand. It is not a question of if significant federal tax cuts are coming in the next two years, but when and how the Fed will react to them.